Yes! You read it here first we have made a little bit of progress!! 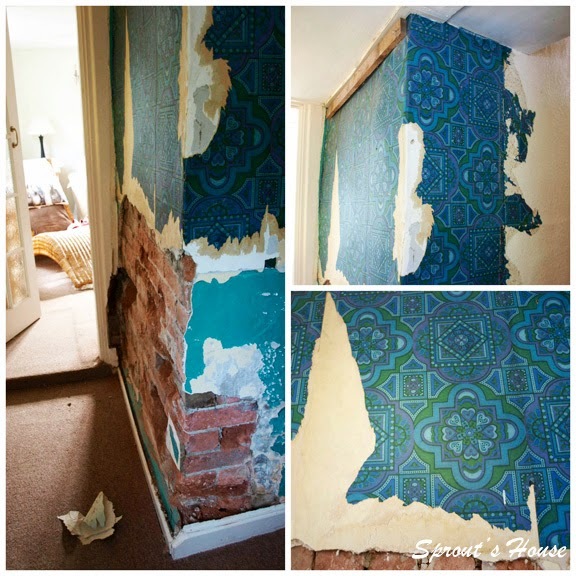 For those of you who have taken the virtual tour of Sprout’s House, you may remember that we rather enthusiastically ripped some plaster board off the wall fairly soon after moving in…..revealing some, well it can only be described as, gorgeous wall paper!! And after today’s events I have the sneaking suspicion that this particularly special example of wallpaper goes up the stairs and around the landing! Only time will tell!! Sprout’s House was built in the Victorian era so she hasn’t taken too kindly to being filled with modern materials and has manifested a few ailments. 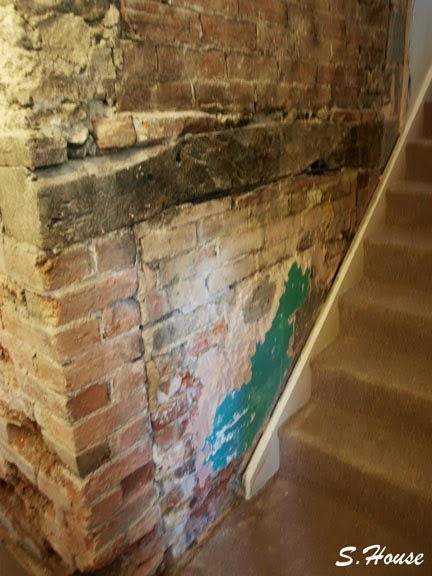 There are a few damp patches around the house along with a rather interesting cotton wool growth in the sitting room and of course our perished bricks. With this in mind we have decided to use lime plaster instead of the modern mixture. Lime is breathable and it’ll mean that Sprout’s House will be able to get rid of any moisture which is lurking deep within her walls. 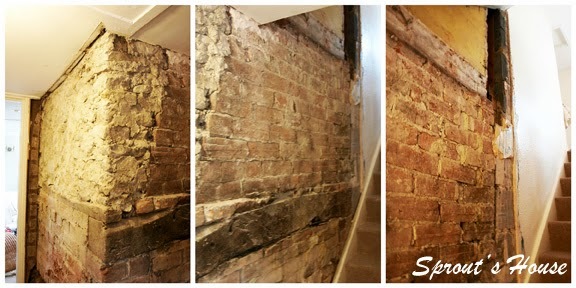 So this weekend we had a man over to discuss repairing and plastering this section of wall in the hall way. Today, Sprout’s Daddy hacked off the rest of the plaster and we got to find out a little bit more about our house. We had always suspected that we would find another fireplace, but we hadn’t realised how big it would be! At the moment, we are mulling over what we should do with it. 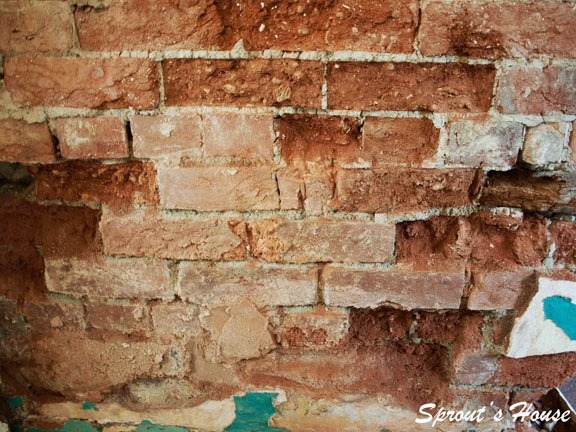 Options being A) Break out the bricks inside and sand blast the timber – leaving it as some sort of alcove. B) As above, but move the stairs so that we can use it as a proper fire place. C) Plaster back over it, which seems a shame especially as once upon a time it would have been the focal point of this cottage – Sprout’s house was once two cottages! So that was our little bit of excitement over the weekend. I would be going for option B ... The most expensive of course and the most disruptive! We opened up an 8ft inglenook and the amount of rubble was staggering as the chimney had been blocked and back filled from above in the 1980's. the added bonus of finding the blocked up 16th century Bastle door at the back of the fireplace kept us motivated and now looks fantastic.